KATHMANDU, May 11: One aspect of India Prime Minister Narendra Modi’s two-day visit to Nepal is religious. He started his third visit to Nepal as a prime minister by landing at Janakpur where he worshipped at the Janaki Temple before flying to Kathmandu on Friday. He is also scheduled to visit the Muktinath Temple in Mustang district on his second day in Nepal. 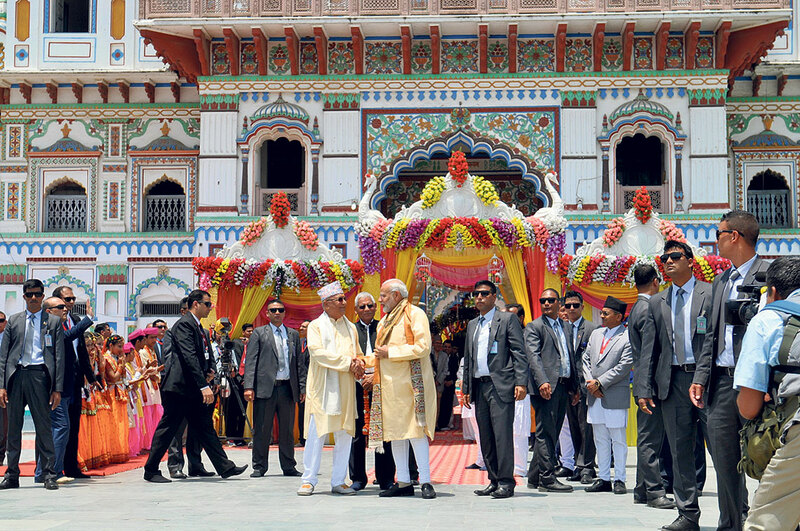 Modi has also said that Janakpur and Muktinath are vibrant centers for pilgrims and tourists. He is also scheduled to visit Pashupatinath Temple in Kathmandu. “This time, I am visiting Nepal more as a pilgrim than as the Prime Minister of India,” Modi said in Janakpur on Friday. Because of his remarks and schedule, his visit is expected to promote religious tourism in Nepal. Tourism entrepreneurs have high hopes from his visit for promotion of tourism in Nepal as he is an immensely popular leader in the international circles. Modi’s visit to religious places of the country could play a positive role in making Nepal’s religious sites popular internationally, according to tourism entrepreneurs. Bikram Pandey Kaji, a tourism entrepreneur, said that the India prime minister’s tour to Nepal plays a positive role to promote Nepal’s tourism. “Modi is quite famous on the international media. So, his visit to our religious places will give a publicity mileage of our religious destinations,” Kaji said. He further added that Modi’s commitment to connect Janaki temple with Ramayan trail could attract more tourists to Nepal. As Indian tourists constitute the highest number of tourists visiting Nepal each year, the Ramayan trail is expected to increase the tourist arrivals in Nepal to a big extent. “Indian tourists coming to visit the Ramayan trail will come to Janakpur and those tourists can be attracted to our other religious destinations as well,” Kaji added. Nepali tourism entrepreneurs are already making efforts to promote Nepal in the international market via the social media. They have also put forward their concept to the government for promoting Nepal via the social media. “India Prime Minister Narendra Modi is very popular on the social media such as Twitter. His single Tweet can promote our religious destinations to the religious tourists across the world,” said C N Pandey, president of Nepal Association of Tour and Travel Agents (NATTA). Pandey further said that this visit may help our tourism industry both in quantitative and qualitative terms. Since the very beginning, the number of Indian tourists tops the list of tourists visiting Nepal. According to the Department of Immigration, a total of 160,832 Indian tourists entered Nepal in 2017 while 34,133 Indian tourists entered in the first three months of 2018. KATHMANDU, May 14: Leaders of various political parties have termed Indian Prime Minister Narendra Modi's recent state visit to Nepal 'fruitful'.